Episode 59 - Rev. M Barclay Dan Sterenchuk and Tommy Estlund are honored to have as our guest, Rev. M Barclay. Rev. 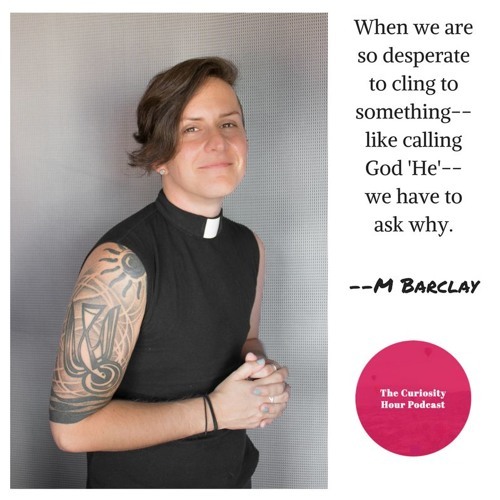 M Barclay is the first openly non-binary trans person to be commissioned as a deacon in The United Methodist Church. They are currently serving as Director at enfleshed - a new ecumenical nonprofit committed to "bringing what matters back to the gospel for justice, liberation, and delight" through spiritual resources, pastoral care, and teaching on intersections of faith and justice. M formerly served as Director of Communications at Reconciling Ministries Network, advocating for queer and trans justice in The UMC. They have also enjoyed working as a hospital chaplain, youth director, justice associate and faith coordinator for reproductive justice in Texas. As a queer and trans minister, M is passionate about writing, teaching, and preaching on finding the Sacred in the people, places, and ideas we might otherwise overlook. Website: enfleshed.com Note: guests create their own bio description for each episode. The Curiosity Hour Podcast is hosted and produced by Dan Sterenchuk and Tommy Estlund. Please visit our website for more information: thecuriosityhourpodcast.com Please visit this page for information where you can listen to our podcast: thecuriosityhourpodcast.com/listen/ If you would like to share your story or have a suggested guest, please complete the "Contact us" form: thecuriosityhourpodcast.com/contact-us/ Disclaimers: The Curiosity Hour Podcast may contain content not suitable for all audiences. Listener discretion advised. The views and opinions expressed by the guests on this podcast are solely those of the guest(s). These views and opinions do not necessarily represent those of The Curiosity Hour Podcast. This podcast may contain explicit language.